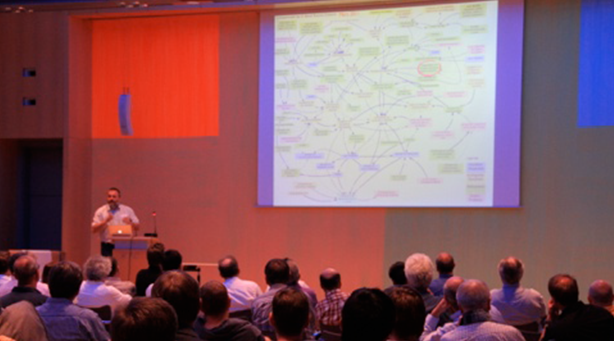 Below, you will find some projects presented by our clients on our user conferences (modeler-camps). Martin Valkysers, IABG: IABG is supporting international operations of the NATO and the Federal Defence Forces of Germany (Bundeswehr) to reconstruct crisis regions by modeling various scenarios qualitatively and quantitatively. In this context the iMODELER has replaced Vensim as a standard tool for visualizing and simulating complex systems. Werner Stich, Deutsche Bahn: The modeler has been used to identify potentials of optimization for maintaining the ICE high speed trains at Deutsche Bahn. By analyzing the simulation runs of the quantitative model, new potentials were identified leading to significantly higher improvements than any actions before. Thomas Meyer, BASF: At BASF, the challenge was to model the plasticiser market in Europe. Within the next 10 years a plasticizer product had to be taken off the market due to legal regulations. Both BASF and the competitors were directly affected by this. The free production capacities should be used for products with the highest possible margin. For this purpose a macroeconomic model has been developed including the future demand per pre- and final product, production capacities of all market-players, market shares, market volumes, market prices, cross price elasticities etc. 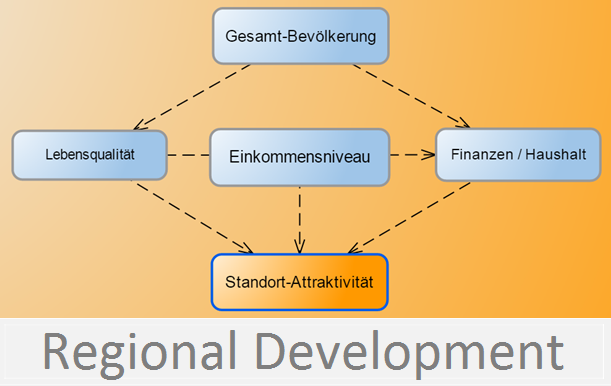 Andreas Poehls, Sparkasse Herzogtum Lauenburg: The Bank is using the MODELER in more and more areas, e.g. 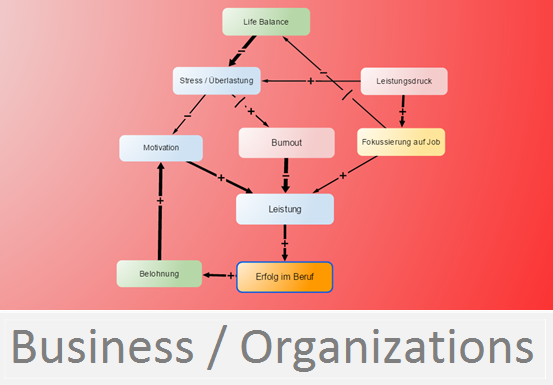 as a mind mapping alternative in meeting situations or as a project management tool. 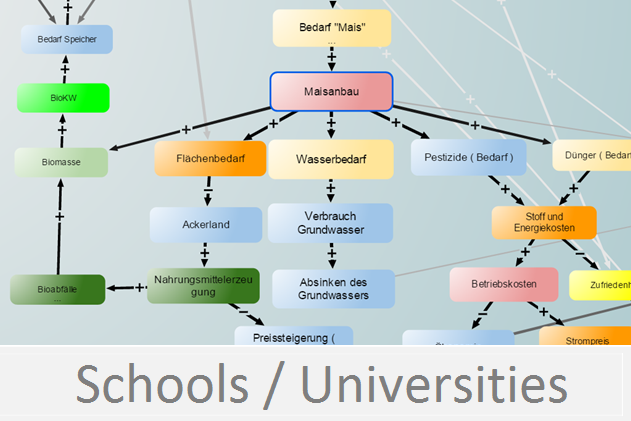 By doing this, it is important to establish the tool progressively - building on the awareness level of Mind Mapping. The benefits: errors can be avoided, processes can be optimized and future developments can be predicted. In the near future, Systems Thinking will be an important part of the internal management training. Christina Berghäuser, Airport Munich (Flughafen München): Christina Berghäuser presented the results of a Human-Resource (HR) project. The project was aiming at identifying the causes for the increased status of employee's illness (of the ground-handling staff) and effective countermeasures. For this, employer's and employee representatives (including the work council) have "modeled" together - supported by Consideo. The result is a common understanding of the problem. The previously unknown causes could be identified. After analyzing and comparing different alternatives, both sides agreed on an effective package of measures. In addition, it was shown why conventional consulting approaches and methods fail. Gerrit Möws, Federal Office of Civil Protection and Disaster Assistance (BBK - Bundesamt für Bevölkerungsschutz und Katastrophenhilfe): Gerrit Möws reported about his experiences using the qualitative modeling - especially in the crisis management group. Axel Felsch, T-Systems: Axel Felsch demonstrated how the modeler can be used in sales talks, in order to demonstrate and clarify the benefits of their technological products and services. Conny Dethloff, IBM Deutschland: Conny Dethloff presented the future requirements for Business Intelligence and pointed out the role that Quantitative Modeling and especially the iMODELER could and should play. Matthias Schmoll, Drägerwerk AG: Models for the strategic human resource planning containing demographic trends of the internal and external labour force were presented. The iMODELER was used for forecasting future human resources requirements to ensure that the organization will have the required number of employees with the necessary skills to meet its strategic objectives. The models helps an organization achieve its strategic goals and objectives, achieve economies in hiring new workers, anticipate and avoid shortages and surpluses of human resources, as well as control or reduce labour costs. HRP has recently become a key strategic priority not just for Human Resource departments but for strategic business planners as well. Willi Kuhn, IG Metall Rostock: The challenge of the local industrial union was to develop a new strategy. For this several workshops were carried out with the members - supported by Consideo. By using the iMODELER, the different perspectives of the participants were integrated in one qualitative model - leading to a common understanding of the problem. In addition, many new insights could be gained by using the Insight-Matrix. Daniel Wagenführer, University of Hamburg: With respect to the stepwise ban of light bulbs PACT carried out a nationwide marketing campaign for OSRAM - with so-called Power Seller in hardware stores (do-it-yourself-stores), to convince customers to use alternative bulbs (including LED, halogen and energy-saving lamps). By using a quantitative simulation model developed by both the university of hamburg and Consideo, the operation of Power Seller was planned and efficiently carried out - with the aim to maximize the conversion rates of marketing actions and thus to increase the sales rates. Martin Gudenrath, Basler Verkehrs-Betriebe (Public Transportation Network): Martin Gudenrath (Chairman of the Board) has presented his experiences to the following topic "Competition in public transport: cost leadership vs. system leadership - or: Why market-based strategies in public transport creates other effects as in the private sector". 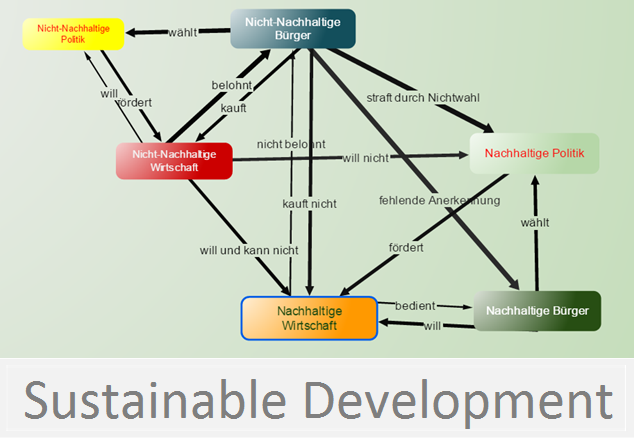 Here Mr. Gudenrath described a successful conflict resolution through a systemic view by using the iMODELER. Ulf Korsch, Deutsche Telekom: Ulf Korsch (Manager Deutsche Telekom Innovation Laboratories) reported as the head of the project "Innovation Values" together with Miriam Feuls (PhD student at MCM University of St. Gallen, Research: Qualitative research) and Frank Arndt (Management Consultant, Executive Coach and CONSIDEO partner) about the application of the iMODELERs for analyzing and improving the culture of innovation at T-Labs. The aim was to model and thus to reflect the innovation culture of T-Labs as a basis for the product development of the concern. Conny Dethloff, OTTO Group: Conny Dethloff talked about his experience in dealing with complexity in trade. He pointed out the potentials of a better communication by using Qualitative Modeling - especially in meetings. Prof. Dirk Fabricius, Goethe University Frankfurt: Prof. Dirk Fabricius showed as an expert in Criminal Law, Criminology and Forensic Psychology the benefits of modeling (qualitative cause-effect modeling) for the Criminal Policy and Research through a concrete example and thereby confirmed the enormous range of application fiels of the iMODELER in practice.